Q: Dear sir, I have been a Bible-believing Christian for over twenty years. Lately, my brother has been debating with me that Jesus has all the qualities of a Savior and that He is the only way to be saved, but says that He was not God incarnate, but only the Son of God. Do all messianic Jews believe this? Could you please give me detailed information as to why, either way? Is Jesus Christ God incarnate, or not, according to Messianic belief? Your time spent in replying to me would be very much appreciated! A: Thank you for your very important question. In my experience, mainstream Messianic Jews—myself included—agree with the Scriptures: Yeshua is God in the flesh. Though never taking away from the fact that He is also fully human (see Acts 2:22, 13:23; Romans 5:15; 1Timothy 2:5 and also perfectword.org/humanity), the Scriptures speak several times of the Master’s deity. The most detailed account of the “incarnation” is found in the first chapter of John, which opens, “In the beginning was the Word, and the Word was with God, and the Word was God” (John 1:1). We should immediately notice that by using the phrase “in the beginning,” John is purposely drawing a parallel to Genesis 1:1, which begins the Scriptural creation account. This is a logical connection, since all throughout Genesis 1, we hear God speaking (“and God said…”), and creation coming into existence through His Word. John further links the Word with creation in John 1:3, saying, “all things came into being through Him, and without Him, not even one thing came into being that has come into being.” So John clearly establishes that in the beginning the Word was creating all things with God and as God. With the Word’s origins firmly established, John then goes on in verse 14 to say that at a specific point in human history, “the Word became flesh.” To become flesh is to say that He became a human being. Indeed, having been miraculously born to a woman (see Luke 1:31-35), He has a human lineage (see Matthew 1:1ff and Luke 3:23ff), as well as a natural family (see Matthew 13:55-56 and Mark 6:3-4). 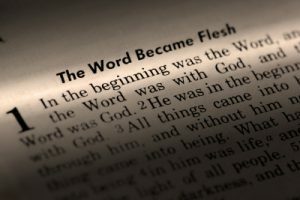 The question is, if the Word “was God” in the beginning, was He still God after He “became flesh”? At minimum, John implies this in verse 15, when he reports that Yochanan the Immerser—who was born before Yeshua (Luke 1:24-37)—said, “He existed before me.” Yochanan recognizes the Word as a man, yet ascribes eternal quality to His existence. Indeed, it is this very man whom Yochanan acknowledges is the Messiah Yeshua (see John 1:29-30, cf. John 17:5). So, according to John 1, the Word was God, He became the man Yeshua, yet retained the eternally existent nature of God. Paul describes Yeshua’s mysterious dual nature in similar detail in Philippians 2:6-12. In becoming a man, Yeshua “made Himself nothing” and “humbled himself;” and yet, at the name of Yeshua, “every knee will bow… and every tongue will confess that Yeshua Messiah is Adonai” (cf. Romans 10:9)—that is, He is yhvh, the Lord… God! On what grounds can we reach this conclusion? Paul’s language clearly alludes to Isaiah 45:18-23, which says in part, “I, Adonai… there exists no God except Me…. To Me, every knee will bow, every tongue will swear [allegiance].” While maintaining the paradoxical tension between Yeshua’s humanity and deity, Paul implies here that Yeshua will share in the allegiance due only to Adonai, because He Himself is God. Such an understanding is hardly a departure from Paul’s other teachings on the subject. In Colossians 1:15-17 he calls Yeshua “the image of the invisible God,” and reiterates Yeshua’s first role as Creator, while affirming His continuing role in holding all things together. But it is in verse 2:9 that Paul makes one of his boldest statements regarding Yeshua’s divine nature, declaring that “in Him dwells all the fullness of the Deity bodily.” So Paul, like John, upheld Yeshua’s unique nature as both man and God. To affirm, then, that Yeshua is the Son of God while also asserting that Yeshua is less than God is inconsistent with the Master’s own understanding of His relationship with the Father. According to the testimony of Scripture, to call oneself “Son of God” was no less than an overt claim to Deity—a claim which, if untrue, was considered blasphemous and worthy of death. The Master Yeshua did not repeatedly rile up the Jewish crowds with purposely misleading claims of deity in order to facilitate a martyrdom based on false pretenses. On the contrary, it was His very truthful claims to deity which ultimately gave the Jewish authorities the ammunition they needed to bring about His unwarranted conviction, sentencing, and death. Though Scripture does not overemphasize Yeshua’s deity—and certainly not at the expense of His equally real humanity—it is nevertheless essential to the Master’s character, as well as a clear teaching of Scripture. Why would God send a redeemer that did not qualify as a Kinsmen Redeemer (man)? i appreciate your addressing this issue cause a messianic group in the town I live in has a teacher in it I found out last Feast of Tabernacles believes Yeshua is the messiah but doeesn’t believe he was God while on earth and was human only on earth. I have a hard time swallowing that I tried to send him websites with scriptures on it so he could see that this view isnt’ correct but he didn’t accept it. I love my messianic brothers and sisters but am concerned about the fact that they are throwing out the baby with the bathwater pray they will not reject truth and will see it in the scriptures themselves. Many worshipped Jesus: If He was not God, Jesus / Yeshua would have been in sin for allowing many to worship Him, and therefore He would not qualify as Redeemer. He was man and God Himself. Great article! Sin is ultimately against God, so only God can forgive sin. He forgave sins as God. Great article. Being fully God come in the flesh, was Jesus omnipresent (one of God’s qualities) at the same time that He was walking the earth? Great explanation. I know someone struggling with this in the Messianic group and will pass it on. Just wanted to say that I really enjoyed reading this article Kevin. But this makes no mention that to claim oneself to be the ‘Son of God’ is blasphemy (if it turns out that one is in fact not the ‘Son of God’). If one were to ask a number of religious Jews about about this phrase ‘Son of God’ (or it’s corollary – that God is Jesus’ Father – see John 5:18), would they agree? Hope I have explained this adequately. Shalom Jan. Is there a possibility that the Jewish leaders invented a pretext to have Yeshua crucified? Sure. But it wasn’t just the Jewish leadership that understood “Son of God” to be a claim to deity — the crowds did as well. Yeshua wasn’t surprised by their reactions — He knew what He was saying (and not saying). Leviticus 24 could certainly apply here. The point is that (1) Yeshua was making a claim to deity, (2) everyone understood that to be the case, (3) the Jewish leadership used that claim to convict him, regardless of whether they based that conviction on Leviticus 24, a preexisting Jewish law, or one they invented for the occasion. Would modern day Jews equate “Son of God” with a claim to deity? Yes, or at least a claim to some kind of divine origins. I agree with john Michael hart, of what he said, There are other scriptures that state the Yeshua always said that the father was greater then him and that he can not do nothing, but the father will. Yes i do agree that Yeshua was the co-creator in heaven and earth, and during the old testament, he was representing or spokesman of the father in his name. but before the heaven and earth was created, Yeshua was begotten forth by the father, so in senses he was begotten or brought forth from eternity, before time began. but don’t make him equal to the father, for the scripture do say the son is subordinate to the father, the father has always been, but the son was begotten before the creation of the heaven and earth before time began.